The practice of any sport is always something beneficial for the body. 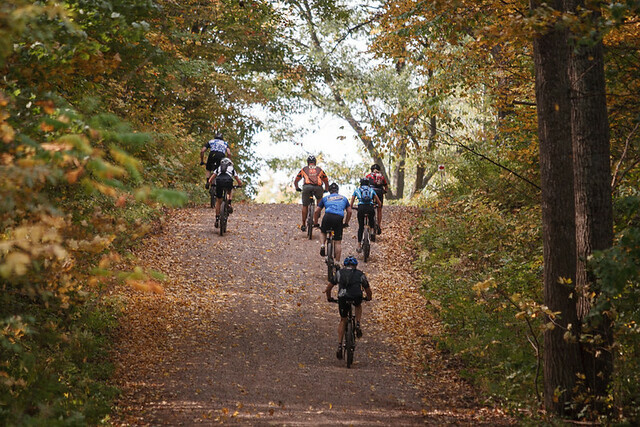 Mountain biking is without a doubt one of the more beneficial sports as a health aspect. It helps us keep the heart healthy and fit, among others. And there are few better places to go mountain biking than in Bryce Canyon. The mountain bike trails here are some of the most scenic trails you can find anywhere. So here are some tips on how to avoid discomfort when riding. But like all other sports, you can only get the best benefits upon acquiring enough knowledge on how to properly exercise with it. If you punish your legs too much; if you are in an awkward position, it may harm your back or have pain in the neck, knees or other parts of the body. The practice of cycling, in that case, will no longer be a healthy exercise, as it will actually become something harmful to your health. 1. Bike to your measure. You must use a bike that fits to your size and morphology. Correct sizing is paramount when purchasing your Mountain Bike. One size larger or smaller may cause discomfort, hence resulting to body pain. 2. Your feet’s comfort. When you ride a few miles on the bike, more often than not, your feet swell a bit. To avoid it, you must loosen the laces and the Velcro of your shoes. It is a mistake to tighten them up, as it only makes your feet suffer. 3. The back, as always. Similarly, if over the miles you feel some back problems, you should replace the power of the bike for a longer or higher one, since the acquired position on the bike is most likely to be incorrect, which causes the back-pain. If you have a delicate back, it is best to not carry a backpack or weight. Instead, adapt to a roof rack for the bicycle. Another way to know if the power to use your bike is right would be to see if there are other areas with pain. 4. Triceps must be strong and healthy. If you have discomfort in the triceps, you probably took the power of your bicycle handlebars too long or too low. You would need to try one with a shorter stem to see if it will improve comfort. 5. Powerful shoulders. If you feel any discomfort on your shoulders, it is probably because the power of your bike is either too short or too high. Again, try another power measurement. It will tell whether or not it is the solution. 6. Relaxed neck. To avoid discomfort and injury to the neck, smooth movements turning the head to both sides should be enough to keep your neck to point. 7. Kneeling protected. Maintaining the correct height of the saddle on the bike is one of the easiest ways to keep your knees healthy. Discomfort in the front of the knee may be due to a saddle that is too low, while the discomfort in the back of the knee may be due to a saddle too high. 8. Safe hands. Hands are one of the natural bumpers of people. If you fall off your bike, the first thing you naturally do is to find a foothold by hand to avoid falling over. The use of suitable gloves for mountain biking will avoid any injuries due to shocks, scuffs and scratches you might sustain. In addition, it will prevent both cold and heat which can damage your hands. 9. Protect your eyes. Roaming with the bike, your eyes are also vulnerable to all kinds of objects of the outdoors, such as: dust, dirt, pebbles, insects and various bugs, twigs, and the like can damage your eyes. The use of sport-goggles for cycling, with shatterproof lenses and UV protection for the sun, is simply a necessity. 10. The helmet of life. The helmet, being an essential element for the protection of the head, has the capacity to avoid serious accidents. Its use is very essential. Never forget to use it. Following the given tips, hopefully it will help you with using the bicycle correctly, preventing simple discomfort and most especially, accidents. Again if you’re looking for things to do in Bryce Canyon, then mountain biking should be high on your list. There are just so many trails and so much to see when biking in Bryce.